Fried rice is one of the yummy and delicious rice dish. Any left over rice is there, good option for making fried rice. It is also great lunch box ideas.Baby corn is almost all children's favorite vegetables.So making baby corn fried rice is good option for chutties. 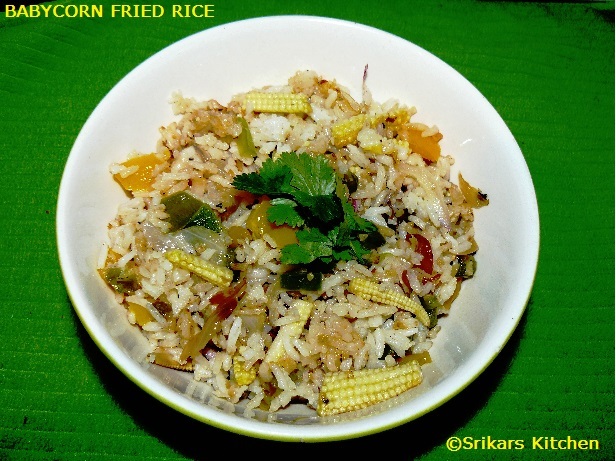 Check more Fried rice recipes here..
Cut the all the vegetables as your wish & keep it aside. Heat oil oil in a pan, add chopped garlic,ginger, sliced onion & saute. Add babycorn, capsicum & cook until tender. Add cracked pepper,salt & cooked rice .Mix well. Allow to saute upto 3-4 mins.Finish with cilantro. Serve hot. you want more spicy , add some red chilly flakes. Soy sauce also may add in this rice. Adding spring onion also a good choice.